Примечание модератора: Тема закрыта, продолжение обсуждения рейтингов WN6 и WN7 ведём в новой теме. Note by Moderator: Topic is closed. Please continue discussion about WN6 and WN7 in new topic. Hi guys, Alexander asked me to start a topic here. We have a 65 page long discussion with several members of the NA forum who are statistics experts. We aimed at replacing efficiency with a formula that effectively and accurately measured playing skill. I wanted to submit the wN6 formula to you for approval to insert in XVM. I sincerely think we have a better formula than PR or Efficiency. I think it is the most accurate and fair formula to measure performance and battle efficiency. Also, it only uses data from player profiles and not the API which does not work well for NA server. This is the formula, I will be glad to answer any doubts and help you incorporate this into XVM. Would like to highlight that MIN() means the number capped at that value, so MIN(TIER, 6) means avg tier capped at 6, (so player avg tier is used if it is lower than 6, otherwise 6 is used) and MIN(DEF,2.2) means defense is capped at 2.2. WN6 formula gives equal importance to frags and damage (although frags is a much more sound statistic, we decided to give them equal weight to avoid kill farming), around 40% of the total score each. The damage is carefully tied to average tier so an awesome player with avg tier 7 and another with avg tier 9 will get similar scores for their damages. Kills was modified to give less score to players with average tier played 1-3 (seal clubbers, or pedotankers). Statistical analysis revealed spots is very important to win games. Players with more avg spots in their overall accounts win more. Maybe it is because they are more aggresive players than the ones with few spots. Spots is less rewarded than in effiiency though, so suicide scouting does not raise WN score. In efficiency, suicide-spotting 10 enemies gave you 2000 Efficiency points, which would make you a super-unicum. In WN, that gives you 1250 which makes you an average player. Also, if you suicide-scout, your average damage and kills drop, so you cannot farm WN by suiscouting. Defense also gives some score, although it is normally 5% of the total, and it is capped at 2.2 to stop defense farming. Cap is not included since statistical analysis proved that 99% or more of cap points are useless points due to sitting in cap at end of game, and do not contribute to a team win. Lastly, we have a winrate term, having 48% wins leads this term to have a value of 0. This term is an S-curve, which rewards winrates above 48%, but using winrate as a proxy to reward intangible skills like map awareness, knowing when to track tanks which leads to team kills, protecting arty from scouts, etc. All these lead to team wins but dont show anywhere else. Nevertheless, this term accounts for 0-8% of total WN6 score. WN6 is impossible to farm, and is also more fair than efficiency, because having a low cap meant it was almost impossible to have a high efficiency score, even if you were an EXTREMELY good player. Efficiency depended on capping too much, which also made it incredibly easy to farm, and also unfair to measure the skills of players who prefer to hunt last enemies instead of sitting in cap at the end of victories. I will be glad to answer any more questions, and if you prefer discussion on a forum I would have no problem. WN6 has recently been incorporated into wotlabs signatures, and will also replace WN4 on noobmeter.com very soon. В общем, похоже на калькулятор туриста, но с лояльным, а не бредовым подходом, хотя, все еще сыро, имхо. По поводу нее: основной упор - дамаг, второстепенный упор - фраги, небольшая зависимость от засвета и дефа базы. Есть ограничение по очкам защиты базы, либо твое значение, либо не больше 2.2. Есть зависимость от среднего уровня танков. Ну и табличка с данными игроков и что по ним показывает его формула. Привет ребята, Александр попросил меня открыть топик здесь. Мы провели дискуссию на 65 страниц с разными пользователями североамериканского форума, которые разбираются в статистике. Мы предлагает заменить формулу РЭ более точной и эффективно отражающей умение играть. Я прошу включить формулу wN6 в XVM. Я искренне думаю, что наша формула лучше, PR (чё это кстати?) или эффективность. Я думаю, что это самая точная и справедливая формула для боевой эффективности. Так же наша формула использует только информацию профилей, а не API, информация в котором работает некорректно на североамериканском сервере. А вот и сама формула. Я буду рад ответить на любые вопросы и помогу вам встроить её в XVM. Для педотанкеров фрагам придаётся уменьшенное значение. С этой формулой не получится накручивать рейт суицидальным засветом. Thanks for translating the basics Twopizza. For an average player, kills and damage give about 40% of final score each, spot and winrate give about 8% each and defense gives 4%. The weight assigned to each parameter was decided by rigorous statistical analysis using evolutionary algorithms. We used a random player sample of 30000 players to arrive at the optimal formulas to balance damage and frags for each tier. The winrate portion is just used as a proxy to evaluate a player´s intangible stats, like map awareness, knwing when to track an enemy (which gives you actually less damage sometimes), helping teammates, stopping scouts from spotting arty, etc. The idea is to reward players for things they do which leads to wins, but does not show up on the profile page stats. Let me say again, that this was worked on for a LONG time. We did not discard cap on a whim. Statistical analysis proved that it was almost impossible to include frags fairly, since 99% of it was sitting on cap at end of game, and so should not be rewarded. Also, I am not respoinsible for noobmeter, in fact, I fight with noobmeter a lot regarding his rating, since his formula is secret, and does not seem to give linear results (compare PR scores for lironman and CTO_... they are almost identical although CTO has MUCH better stats. Lastly, spots is still important in score, but less so than efficiency, which make suicide-scouting a way to farm efficiency but not in WN6. Where I can check your formula on the real data? Web site or smth else? 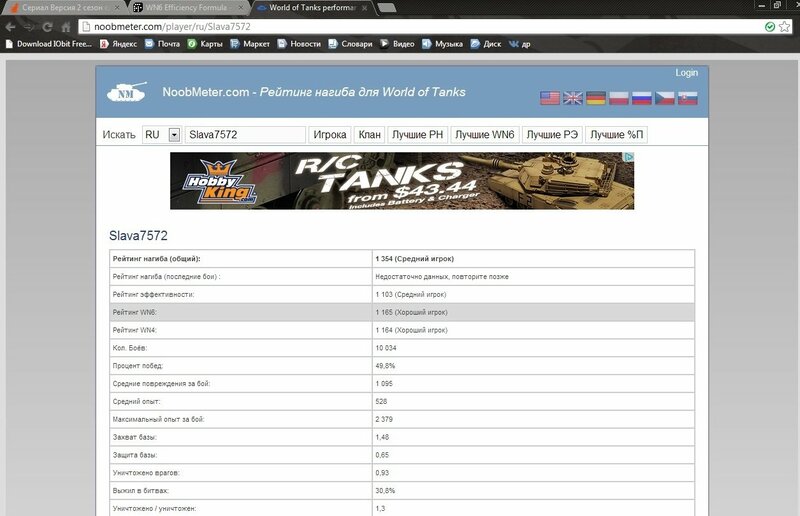 wotlabs.net uses WN6 now, and noobmeter.com is adding it as we speak. Dont have my own website. Like I said the formula is a group effort, and non-profit. what is the formula for average tier? I don't quite get your question. Tier comes into play for frags (for which tier 1 and 2 recieve less points, 3 a bit more, 4 a bit more and so forth, but is constant for tiers 6-10). Tier also comes into play for measuring damage. We took average damage done at each tier and adjusted an exponential formula to that data. The damage a player does is related to the damage "expected" of him for that tier, the average damage. If he has the average damage, he gets around 400 points, 800 points for double the average damage at that tier, and soforth. Penalizes players with low average tier a bit more, to bring seal clubbers or pedotankers rating down. Players with average tier less than 6 get increasing penalizers, 60 points for avg tier 5, 120 for tier 4, and so forth, 300 for average tier 1. 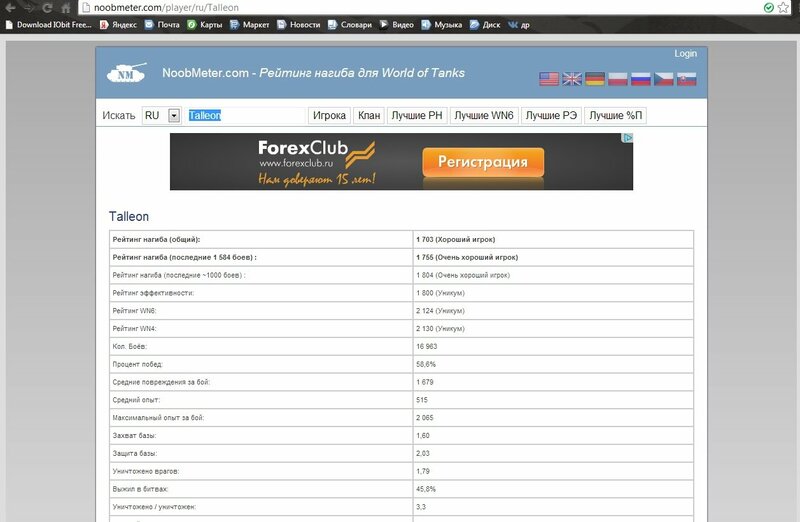 @Praetor77, i think @sirmax mean "how do you calculate average tier of the account"? Did you missed "MIN(TIER,6)" in line 2? You need to wait 1 week before stats in DB will be updated. OH!! Stupid me! Sorry about that. No, sirmax, the damage part has no tier cap, since that adjusts the average damage for each tier. Normal average tier would be 2 ((40*3+30+2+10*2+20+10+10)/120). If we could count Su-26 games as tier 5 and Bison as tier 4, the avg tier would now be 2.83 (40*5+30*2+10*4+20+10+10)/120. Don´t know if this could be done, but it would definitely be an improvement. Otherwise, just normal avg tier would be fine. Wargaming works under rebalancing arty between 10 tears, so it's pointless, imho. Yeah that would only be temporary until arty rebalance, and would only be worth it if it was easy to implement. If we could count Su-26 games as tier 5 and Bison as tier 4, the avg tier would now be 2.83 (40*5+30*2+10*4+20+10+10)/120. It's easy, we have vehicle class in data. Done, new data will be collected with this improvement. Sorry for the mixup, although that WOULD improve WN6 accuracy, it would be confusing probably. The difference will be almost always, because we are updating data once per week, while other sites use current statistics.